Born in Madgeburg, Germany, Gustave Baumann is best known for prints made from his detailed hand-carved wood blocks. His family immigrated to the United States when he was a child, and he grew up in Chicago. He returned to Germany to study in Munich at the Kunstgewerbe Schule and then took further training at the Art Institute of Chicago. He spent time in Indiana, and is much associated with the artists who gravitated to Brown County. 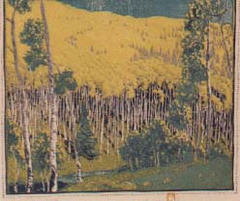 In that state, Baumann made woodblocks illustrating work by Indiana authors. Baumann and several other artists decided to see first-hand the reportedly light, clear air of New Mexico that they had been hearing about from other Chicago artists, and in 1918, he settled in Santa Fe where, for over fifty years, he participated in the art community. He created colored wood blocks from which he made prints, and also became a carver of saints and marionettes, working the the Marionnette Theater, and carving his 'little people'. During the 1930s, he was WPA co-ordinator for Santa Fe, NM.